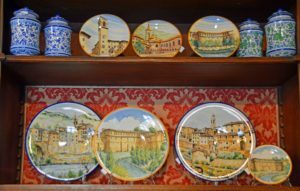 Ceramic Art The Ancient Casteldurante (Ceramica d’Arte L’Antica Casteldurante) is known as one of the best places to learn about this rich artisan history and purchase the art. 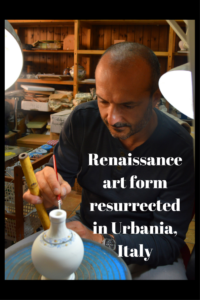 Renaissance ceramic art is being resurrected. Entering the shop I am amazed at the beauty surrounding me; plates, bowls, vases, frames, canisters and a large intricately detailed tile painting. 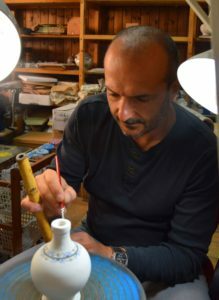 Giuliano Smacchi explains many of the pieces are designed after local 15th and 16th century ceramics. 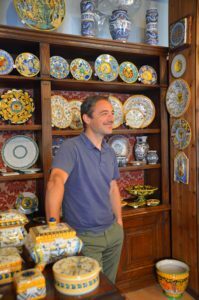 Giuliano Smacchi explains the history of ceramics in Italy. Smacchi and Gilberto Galavotti received their art diplomas in1987 at the Urbino Art institute. Smacchi later received a second diploma at the Fine Arts Academy in scenography. The men also started to learn the technique of majolica (Renaissance earthenware coated with a tin oxide glaze and highly decorated). At first they produced pieces as scholars, but in 1995 they opened their own shop. The men researched shapes, old decorations and glazes, and revived the art and ceramic history of the area. 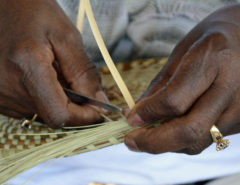 Each man individually creates smaller pieces and together they work on major projects. 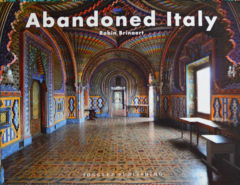 The classic period of Casteldurante and Urbino is their hallmark. Giuliano Smacchi (left) and Gilberto Galavotti pose in front of one of their masterpieces. After Smacchi explains the history of the art and the business, he invites me to see Galavotti at work. Gilberto Galavotti paints intricate designs on a vase. vase. 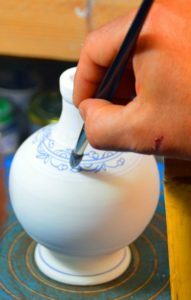 I am mesmerized watching his expert touch as he applies blue paint along the neck of the vessel. Centuries-old Urbania ceramic pieces are displayed in museums all over the world. 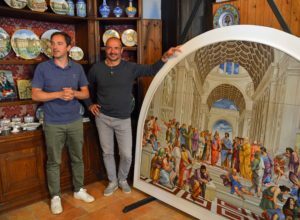 Fortunate for today’s collector, Galavotti and Smacchi are making new treasures by using traditional methods; creating new designs as well as resurrecting the area’s historic patterns. I stay a long time watching Galavotti work before making a purchase and heading back to Palzzo Donati in nearby Mercatello sul Metauro for more Renaissance adventure! I so appreciate modern artists keeping the old world crafts alive. It shows us not only beauty, but patience and diligence. I agree; their desire to keep the art alive and their talent are amazing!! Pretty portion of content. I simply stumbled upon your site and in accession capital to claim that I acquire actually enjoyed account your weblog posts. Anyway I will be subscribing to your feeds and even I fulfillment you get admission to constantly quickly. Thank you!! 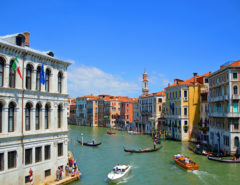 I will be posting more about Italy soon! Thanks for sharing superb informations. Your website is so cool. I am impressed by the details that you have on this blog. It reveals how nicely you understand this subject. Bookmarked this website page, will come back for more articles. You, my pal, ROCK! I found simply the info I already searched everywhere and just couldn’t come across. What a perfect website. You are so welcome. I hope you will continue to check out my website! !